Happy Thanksgiving, everybody! On the day that this review is released I'll be thankful for the usual boring things like family and blah blah blah. The next day I will be thankful for Pepto Bismol because I plan on stuffing my friggin face with so much unhealthy crap on Thanksgiving that it'll make Michelle Obama cry. Sorry, Michelle. Gardening season is over. It's fat time. Thanks to October being International Merlot Month and the two Merlot's reviewed here in Market Vineyards Month, Merlot is now the top "labelled" variety on this website. So it's been tagged here in more reviews (varietals and blends), articles, memes, whatever than any other varietal. I'm assuming it's been actually reviewed the most too but I'm too lazy to do the research. Check out everything I've labeled with Merlot by clicking here. Market Vineyards prides itself with its connection to its home in Red Mountain, however all of the wines I've reviewed by them so far have only qualified for the Columbia Valley AVA. But that changes today. 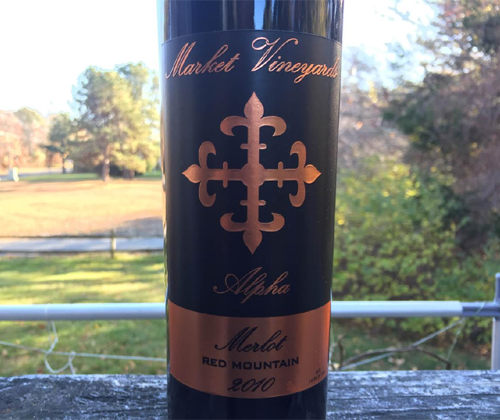 Their Alpha Merlot wears the Red Mountain AVA on its label. It's 100% Merlot from Red Mountain Vineyards, only 96 cases were produced, and the final ABV is 47.9%. This Merlot was given the name "Alpha" and it's their most expensive wine, so I'm expecting this to be the big bad alpha wolf of the Market Vineyards pack. The definition of what they're all about, and also the most badass of them all. It's also from 2010, the same year my daughter was born. I always appreciate a 2010 more because of that, as I will for 2017's with another daughter coming in May. 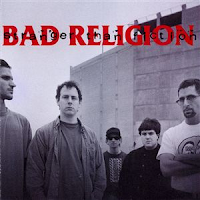 I'm reeeeally pumped for this one so for today's music selection I have to put on one of the ultimate pump-up bands ever: Bad Religion. It's going yeah, yeah, yeah, yeah, yeah, yeah, yeah. Oh yeah. The color of the wine is a deep garnet. The nose has... GODDAMNIT! Can I just drop a rating right now and go enjoy this away from the computer? Seriously! No? Come on. This blogging thing is difficult. I get all this awesome wine but I gotta sit here in front of a computer and write about it instead of getting messed up and falling backwards off of porches. By the way, this is probably a good time to say that I know it's been awhile since I've put out one of my history / science / uber-geeky wine articles but there's a reason for it. I've been spending a few months, that's right: MONTHS, writing a three part series that will come out in December leading into Christmas. The name of the band I'm listening to today may have some relation. You'll see. The nose has juicy cherries, mocha, fresh bbq rosemary, vanilla and cinnamon. The way it all comes together makes me want to slam my Riedel onto the desk and shatter it. But a Riedel broke in the sink the other day and it was gutwrenching so I cannot, no -- WILL NOT, go through that pain again. Do you think you know grief and suffering? Because you do not, my friend. On the midpalate it's medium bodied and smooth as velvet with soft tannin and very low acidity. Big, concentrated flavors of cherries and blackberries with cedar, cool moist sand and dark chocolate. The finish turns grainy in mouthfeel as the tannins kick up their game, and flavors of blackberries and dark chocolate last incredibly long. ENOUGH! Five out of goddamn five. Goddamnit. THAT is how high quality, boutique Merlot is done in Washington State, son. Outgoddamnragious.